Only 6.5% of the total amount of earthquake relief aid promised during an international pledging conference in Kathmandu in July 2015 has been received. Donors pledged a total of Rs410 billion ($4 billion) of which the government has only received Rs 26 billion, says the National Reconstruction Authority (NRA). Of the big donors, the government has only received Rs 6.62 billion from the World Bank, Rs 4.9 billion from Japan, Rs 3.70 billion from International Monetary Fund, Rs 3.28 billion from EU and Rs 2.58 billion from ADB. None of the money promised by 12 countries has come in, although a few of them have signed agreements with the government. The government is yet to sign an agreement with the Saudi Fund which committed Rs 3 billion, Canada which had pledged Rs 1.5 billion and Sweden which had promised Rs 1 billion. There has not been a followup agreement with Austria and Turkey, which also promised help. According to the NRA, Nepal has signed agreements worth Rs 306 billion for reconstruction, which is 75% of the total pledged. But many countries included their regular grants as well as relief in the committed amount, which brings the actual pledged amount to Rs 343 billion. To date, only Rs 75 billion has been spent on reconstruction. “They made announcements of generous pledges after the earthquake, but we never heard from them again, we will have to follow-up with them,” says NRA Chief Yubaraj Bhusal, who acknowledges that there are spending bottlenecks. 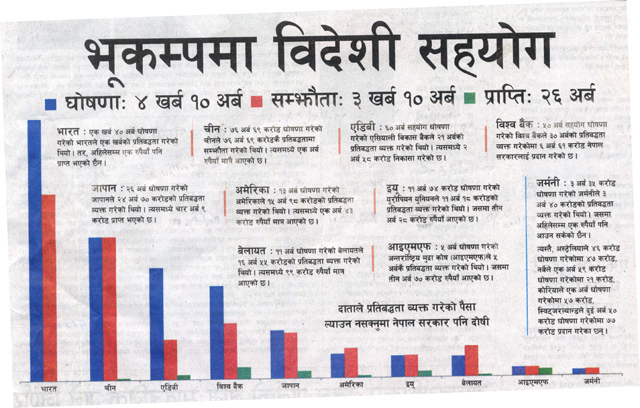 Even if Nepal receives all the committed money, there will be a shortfall of Rs 4.5 billion. “We may have to call another donor conference next year to cover the shortfall,” adds Bhusal. Likewise Norway has released only Rs 210 million of the promised Rs 1.59 billion, Korea Rs 570 million of the announced 1 billion and Switzerland Rs 770 million of the Rs 2.50 billion pledged. Lets assume Nepal got all the money. Then politicians and government officers will siphon the money anyway. Poor Nepali will never get their hands in the fund. In the name of development, funds will dry out. It is better if donors dont send money. Nepali needs to learn to be independent. Repercussions of Kathmandu running Hashtag gobackindia. Anyway it’s good as social media nationalist must have pledged billions of dollars themselves. Charity begins at home. Not for one moment do I believe this.An excuse for this corrupt government to carry on stealing more international money.They have a fine record on this,money has obviously been filtered into their own coffers. Usually proven result gives more money than forever cloudy info.